Well, she didn’t need to ask me twice! Having the late shift on Friday meant that I could get up very early, get the car out of the latest snowbank I had stuck it in, and get to Jamaica Bay for a couple hours’ birding before getting home, finding parking, showering, and catching the train to work. So that is what I did. Now, after a blizzard it is not like the park rangers go out and shovel the trails at Jamaica Bay. So walking out along the south side of the West Pond was more of a slog than a walk and it made using my scope interesting because sometimes the tripod would break the crust of the snow, sometimes it wouldn’t, and, worst of all, sometimes only one or two legs would. But deep snow didn’t matter; I was out birding! Above is the south marsh at high tide under snow as viewed from the West Pond trail. The tide was as high as I have ever seen it at Jamaica Bay, and I imagine that this had to at least be partially because of the huge amount of runoff from melting snow. Below is the West Pond where the variety of ducks and geese was very low but the numbers were good, with 312 Snow Geese leading the way. The snow cover made finding food difficult for sparrows and other passerines but I did spot White-throated Sparrows, Song Sparrows, Yellow-rumped Warblers, Northern Mockingbirds, Carolina Wrens and others foraging as best they could. In the pond and on the bay I spotted single Common Goldeneye and Lesser Scaup and lots of American Black Ducks, Canada Geese, Brant, Mallards, Bufflehead, and, of course, Snow Geese. 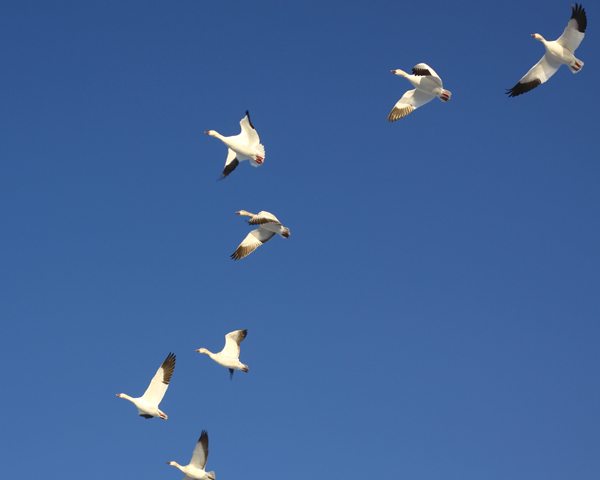 The Snow Geese were originally all loafing on the West Pond, as they tend to do at high tide when the marshes they feed in are all underwater, but while I was out on the Terrapin Trail they started flying out from the West Pond and heading southwest, which meant they were coming my way! I quickly prepped my camera as best I could but I was shooting with my 50mm lens, so some of the shots you see below are rather cropped, but still, shot with a 50mm lens! After the Snow Geese flyby I couldn’t really expect to see anything better so I made my way back to the car, with snow in my boots, and headed home and, eventually, to work. Somehow, the workday didn’t seem as long or as annoying…I wonder why? Nice photos! 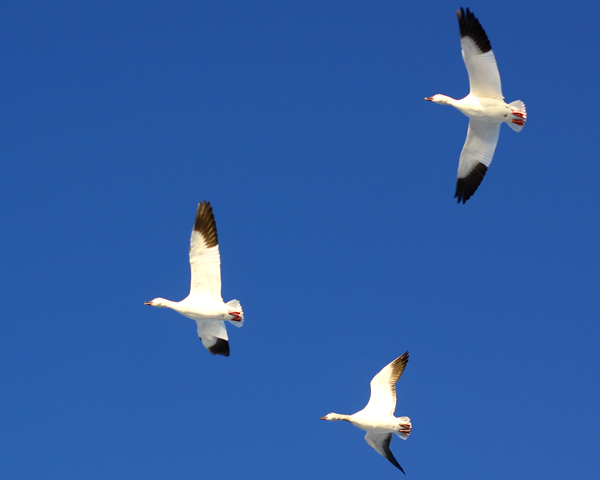 It’s great when Snow Geese fly that low. I was wondering what Jamaica Bay would look like after that storm. The colors in those first two photos are gorgeous. Yesterday I was watching snow geese too, and Ross’s and speckle-bellies. Charlie should have been there…first time we have seen yellow-headed blackbirds since he spotted one years ago. I have a lovely memory of birding a snowy Jamaica Bay when I was just starting to bird. I was thrilled to see a Junco sitting in front of me at the entrance of the Terrapin Trail, and so happy that I knew what it was.